Have you tried baking strawberries before? They’re delicious. A great idea if your strawberries are a little past their best and need using up. Baked in lemon juice and vanilla means there’s no need for any extra sweeteners like Stevia this time keeping them lower in natural sugars that won’t spike your ketone levels. 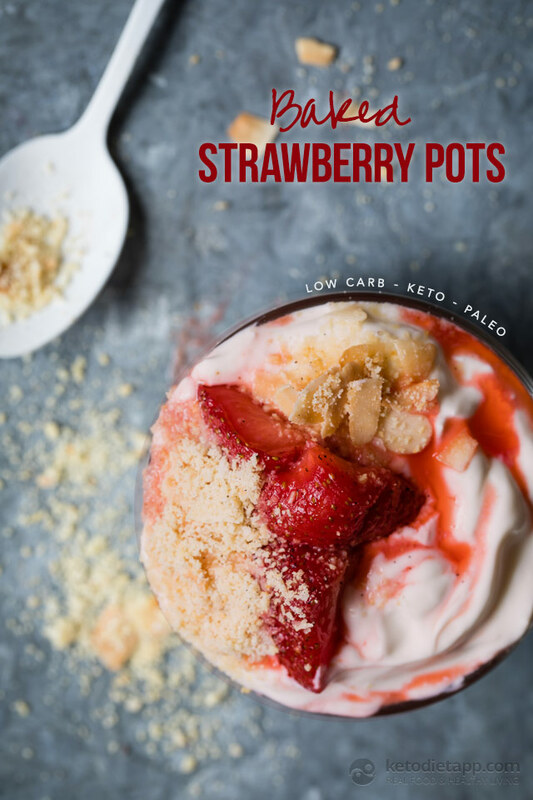 I love these Keto Baked Strawberry Pots for breakfast and as a pudding treat. They can be packed into glass jars and enjoyed on the go too. So versatile and easy to make. The easy toasted almond crumb just makes the whole dish sing. Lip smacking noises came from the kitchen downstairs whilst I was shooting a picture of this one. I think the family think this one’s a winner. I hope you do too. Preheat the oven to 200 °C/ 400 °F (fan assisted). 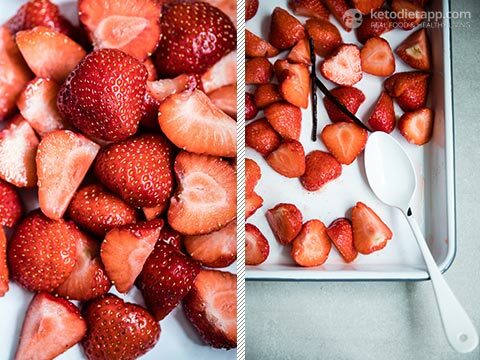 Remove the stalks from the strawberries. Cut the strawberries in half, or quarters if large. Place on a non stick baking tray. Split open the vanilla pod and add to the tray of strawberries along with the lemon juice and water. Mix. Roast in the oven for 15 minutes until soft but the strawberries still retain a slight bite. Once cooked, remove from the oven and allow to cool. 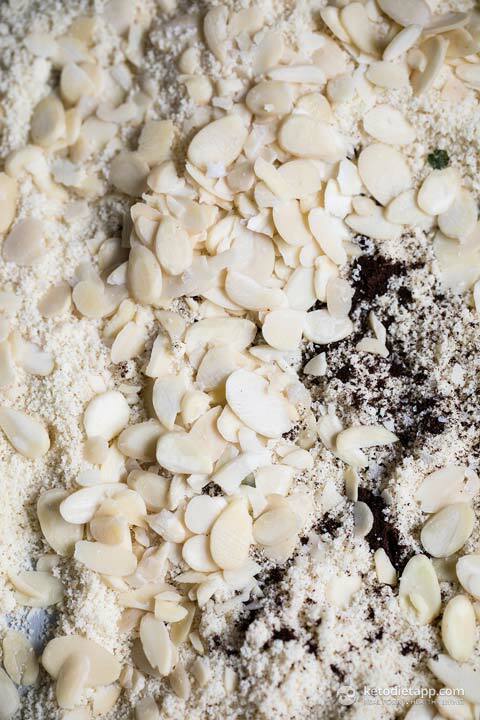 Meanwhile place the ground and flaked almonds, vanilla and salt on another baking tray. Mix and toast in the oven for 15 minutes until golden. After 12 minutes add the coconut chips and allow to roast for a further 3 minutes until brown. Remove from the oven and allow to cool. 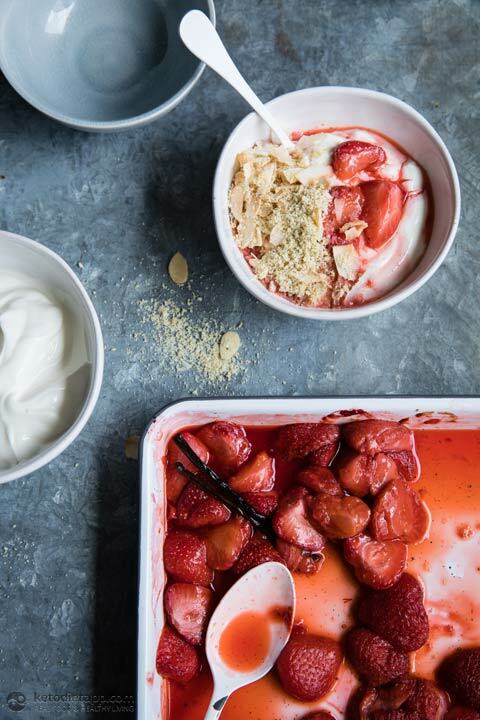 Layer the strawberries and yoghurt in a pot or small bowl and top with the almond crumb. I tried this recipe it's delicious, it's a great idea to use up older strawberries however can I use frozen strawberries will this work? Thanks. Is this meant to be savory or tart? Hi...these look delish.. using whipped cream instead of yogurt will bring down carb count by how much? It will reduce the carb count by 2.5-3 g of net carbs per serving if you use whipped cream instead.